Regular readers of our blog will have noticed we have NOT mentioned nb Waiouru in any of our blogs since late March. 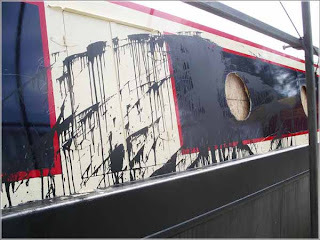 This is because we have been in dispute with the builder Ben Harp Narrowboat Builders Ltd regarding the status of our boat. We decided not to post anything about the dispute involving Waiouru as we didn’t want to exacerbate the situation. Unfortunately the matter continued to deteriorate which eventually resulted in us employing solicitors. We have had two High Court hearings in the Royal Courts of Justice, London and four court orders have been issue requiring compliance from Ben Harp Narrowboat Builders Ltd. Ben and Kelly Harp not only ignored these High Court orders but actually defined them. The court ordered us to be given access to our boat for the purpose of inspecting and valuing the boat. Ben & Kelly Harp were claiming it was worth £91,000 whilst the photographic evidence suggested a value less than £40,000. Our surveyor was consistently denied access to the boat to verify their claims. Eventually we had a High Court order giving us access. That’s when the Harp’s claimed they had sold our boat and the one at their premises was a different boat. They couldn’t sell it. Accordingly to the contract we had the Title to the boat from the First Stage Payment. Moreover, if it were sold; according to the contract we had the first right to buy. The High Court then issued another order directing the boat wasn’t to be moved or interfered with. Again Ben Harp Narrowboat Builders Ltd ignored the court order and modified the boat to disguise it so we wouldn’t recognise it. Last Tuesday they advised our solicitors they would comply with the court order and allow access to the boat. Obviously they thought we wouldn’t recognise it after all the modifications! Our solicitors replied advising we would accept the offer to inspect and would be accompanied by the shell builder, Tim Tyler. The offer to inspect was withdrawn the same day! <surprise>. In their same advice they told the solicitor they intended to tell the High Court Judge they wanted another 14 days to prepare their defence. We knew they were modifying Waiouru and guessed they were converting it to a “sailaway” for a quick sale. We were quickly back in the High Court last Thursday and were given the final court order. Even the Judge could see through their scheme. The latest order gave us immediate access to Waiouru; using force if necessary; accompanied by the police and Tim Tyler. If the boat was Waiouru the order gave us the power to immediately cease her. As we suspected she had been modified and stripped to a bare shell (I’ll blog more on this later). Having run out of time to sell Waiouru to another unsuspecting purchaser Ben Harp Narrowboat Builders Ltd vented their frustration by maliciously damaging Waiouru. I’ll only post some of the photo’s from today but will post more later and also provide a more detailed explanation of the entire story. Our thanks to those who have know what has been going on and have kept matters confidential. The lining, ceiling, wiring, partitions and cabinet work has been stripped. This is NOT a £91,000 boat! I had some inkling as to what was going on, through mutual friends. However, these photos are truely shocking. I hope you will be able to get a more professional builder to finish the boat off for you. Having heard reports of some of Ben Harps other work, the only comfort may be that having had the wiring removed may turn out to be to your advantage. I'll second Adams comment, at least you won't have to try and sort out the bodges. Have roller will travel. David, I did tell you you might have gotten the worst end of the deal with your Ben Harp boat. I did wonder why no mention. I am so so sorry for you both. 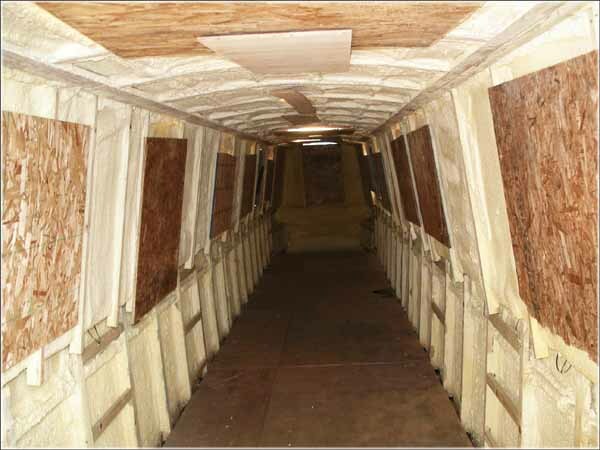 If you want a quality build finish, try Aqua Narrowboats at Mercia. Again, not a great start and these people (if i can call them that) are not indicative of the vast majority. I hope and pray to see you proudly at the tiller soon. We refuse to allow this to destroy our retirement plans. This is another of life's challenges to be overcome. Hi, I am so sorry you were unfortunate enough to choose these boat builders. It brings back so many memories, as this happened when we were having a fully fitted boat built. We were left with an empty shell, no engine, windows or doors, it was a nightmare. This was Seven years ago. We had paid £36,000 and were left with a shell and no money!! I am happy to say we plodded on and managed to finish the boat, so please don't give up on your dream, as hard as it is to imagine this awful episode in your life will soon be a distant memory, when you are sailing along on the boat you always wanted! Good look and don't let the buggers get you down! Hi Tom and Jan. Just read your blog this evening. Having known a little of what you have already been through we are absolutely appalled at what we have just seen in the pictures. You are obviously dealing with very unreasonable people, and hope this is a warning to others about Ben Harp. Wishing you better luck and progress in this dreadful situation and hope that you have a quick conclusion so that you can progress with your lives. Well done for posting about it. SO sorry you have had to go through all this. So glad you can still be positive about it. Hope the final outcome will yet be what you dreamed of. I feel gutted for you,the information on the shoddy treatment given out by the Harps should be published far and wide. Shysters and conmen come to mind. I was expecting something like this from our brief conversation at Crick; but this is much worse than I anticipated. 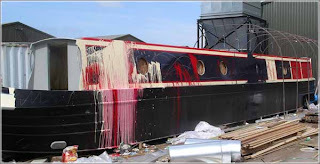 Have a word with Stuart Harper of Barnowl Narrowboats 07725008033( Caxton's builder) he has dug a couple of people out of this kind of dilemna and he may be able to help you salvage things. At least the time of staying silent is over and you can get on with building your boat. Like all the others, I'm so sorry it's turned out this way, but at least you'll be able to make a fresh start on it, even if with a lot less money than you had! I do hope he's not exhibiting here at the IWA, I wouldn't guarantee his safety! I've tweeted your post to spread the word as quickly as possible. I really feel for you at this time, and hope it will all turn out well in the end. As for Ben Harp, I cannot beleive that anyone would destroy their business in this way. With the power of the internet and the towpath telegraph his business is all but over. Chin up and all that. Paul from somewhere on the GU. So sorry to hear about this. During our build it was obvious that Ben had the propensity to fall out with various people, but I never imagined him getting this nasty. We had problems with drawn out delivery times, and the electrics had to have a different electrician to sort them out and stop blowing the senders on the engine. Hope you can get sorted out and we look forward to Waiouru joining Waimaru on the cut. As I do more research into this nefarious couple I find more of their previous customers who are saying exactly the same thing. Poor workmanship a terrible customer service. At least you dont have to stay silent any more. The pictures are awful just shows you what b******s these people are. Dont let them beat you. You poor people - this is awful and must have been hell from start to what we hope is finish. You above all deserve to have many good times on the cut, which we hope goes towards making up for all the things you have been through. This is dreadful! And it reflects badly (and wrongly so)on all boat builders....you have my deepest sympathy! What a horrendous experience for you, it's not much comfort but let's hope the lying cheating "boat builder" goes bust. Hope it doesn't put you off our country! Debs off Tickety Boo (commented above) is a friend of ours. We know what she's been through, yet by sheer determination she achieved her dream against all odds. I can't imagine how I'd feel if someone did that to our boat.. I know Ben from old as I moored behind him at Great Haywood. The way he spoke to his co worker was awful and his language would make seasoned prison officer blush. I so sorry he has made this experience so horrid for you. So sorry to hear this has happened. It must be devastating. Hope all goes well and you can get the boat finished by another, more honest, boat fitter. They are out there! Take some comfort from all the supportive comments you are receiving. 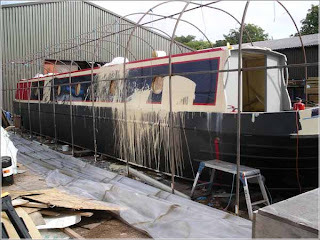 There are a number of reliable boat builders out there and I am sure that their names have been passed on to you; here is one WE can recommend, Stuart Harper of Barnowl Narrowboats. Our first boat was so pain free that we have asked Stuart to build number two and I am sure he could help you out of this mess. Check out his web site. Best of luck folks. We met at Crick when I was with Lesley and you recognised the two dogs. You hinted then at the problems with Ben Harp. This must be heartbreaking for you both. I hope all the supportive comments make it a Tony bit better for you. Good luck. I am sure it will resolve itself and as Northern Pride say the bad karma will boomerang back on them. Don't give up the dream. I was shocked to read this and very cross too.. I hope you don't mind but I am going to put a picture on my blog this evening. If you wish me to remove it just say. You have been very strong in your actions although costing you thousands of pounds, but they will be finished in business for ever. It will be all over google in a day. We both wish you all the very best in getting your dream boat back to the way you want, and your dreams of retirement can continue again. I am sure you must be heartened by all the comments you have received. There are a lot of people who care out there you know. Very sorry to hear of your terrible experience with BH. Having recently taken delivery of our new boat I cannot contemplate how heartbreaking it must be. However you sound like the sort of folk who will prevail eventually. When you do, and assuming you continue with the Empirbus system, we could swap notes as our boat also has this great system. Keep at it. Take the buggers o the cleaners if you can. We don.t need this type of peasant on the cut. What you have gone through is terible and is not the norm with proper boat builders in this country. Clearly Ben Harp wont be in business much longer. I just hope that this hasnt cost you too much money. As a marine surveyor I get to visit a lot of the boat builders and can agree with Lesley that Stuart Harper at Barnowl is a good man. He does understand what he is doing and the finish of build is good. I wish you well and hope you eventually get afloat. 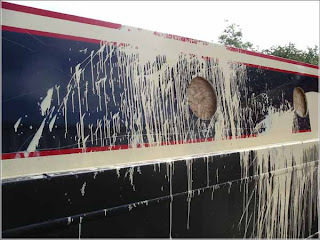 As a really potential boat owner and self employed business man I am appalled over what these idiots did to themselves, and I have emailed them to say so. This will get better!!! Mike, Garnet, Ontario, operator of the slowest local Triumph, 1956 TRW. schell says.... Tom and Jan,Keep up the positive attitude, tread carefully with this ruthless builder. As you have always dotted the 'i's and crossed the 't's this turkey does not now what he is up against with you two in the courts. I fell upon this by accident via 'Retirement with No Problem' and I am truly shocked. We are going to be in the market for a boat fairly soon, so for us, this is helpful - one place not to go to. We picked 'Kotare' as non English lock keepers can pronounce it easily. The more I read about this the more I admire your grit. I'm glad this storey is on the internet. You can rest asured BH will not trade on the cut ever again. In such a small community bad news travels so fast, I should think most people know about him by now. Above all I find BH's agressive behaviour appalling, he is absololute scum. Just arrived at your post via Maffi's blog. What a horrible start to your boating dream. Good luck with the rest of the build. I will no longer complain about my build as it is nothing compared to yours. Well we are also sorry to read about your own experience with the Harp's. Unfortunately we have subsequently found out through our blog there are a sizable number of people who have had a similar unpleasant experience! Fortunately the vast majority of us are honest, caring and considerate. The minority are something to get upset about and then realise they are pathetic and a blight on society. this guy is real scum he riped my son off ows him @800 quide in wages after 15 years in the army i was gonna give him a visit but wife took car keys n wouldnt give them back you never know i may meet him one day. I'm sorry to read about your son's experience and don't doubt his loss of £800 was just as severe for him as the tens of thousands Ben Harp owes us and the other victims. Your son might want to consider a complaint to the Stafford police and be added to the list of witness when Ben Harp finally arrives at court. Came across ur blog whilst trying to get mine up & running via nb No Problem. My heart goes out to you & hope you stay well & strong enough to see this through. Your time on your wonderful nb will then be even more precious. We had a few worrying moments & initial problems but what happened to you was disgraceful & sickening. We are determined to complete Waiouru and continue our retirement dream. No good comes from dwelling on the "nasties". Besides; they are vastly outnumbered by so many genuine, concerned and caring people! I'm please you left a comment as we've found your blog. Hope to see you on the cut one day! About 7 years ago when I was approaching early retirement I was looking for a builder for a narrowboat for my retirement. I went to Crick and took hundreds of photographs of the boats on display there. One of the builders that I liked was Ben Harp. When I got on the narrowboat (appointment required) I liked what I saw and proceeded to take some pics. I was stopped by a lady who I think might have been his wife and told that "Ben doesn't allow people to photograph the interior of his boats." I asked why? She said it was in case people copied his ideas. I found this very strange and not really the way to "sell your boats." So I left rather disgruntled. So it comes as no surprise that I'm now reading articles of his dealings with customers involving lawyers and courts. The damage to Jan & Tom's bought is nothing short of disgusting. Jan & Tom, I wish you all the best in getting your boat finished and wish you many happy years aboard. Hugh.